Auntie Renee's unique gift for using puppets in her performances will delight audiences young and old. Auntie Renee has performed for countless audiences with extraordinary storytelling. Face Painting Party Package: Face painting and stickers. Thirty-Minute Party Package: Auntie Renee will perform for 30 minutes. 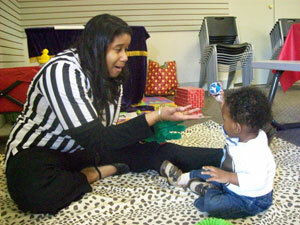 The performance will include interactive stories, puppets, music time, games and fun. One-Hour Interactive Party Package: Includes 1 hour of activities, music time, games, stories, puppets, face painting and fun for up to 15 children. Auntie Renee’s crew will entertain the children for 30 minutes, and then Auntie Renee will perform for an additional 30 minutes. Fifteen goodie bags are also included (additional bags are $3 per bag). Call Auntie Renee to make your next birthday party one they'll never forget. Auntie Renee and her assistant will facilitate the party with 1.5 hours of stories, activities, games, songs with instruments for music time, puppets, interactive play, face painting, plus 1/2 hour of helping to serve lunch, singing happy birthday, and cutting and serving the cake for up to 15 children. Face painting and 15 goodie bags are included (additional bags are $3 per bad). The Princess Add-on: 3 Princess stories/games will be included plus Princess Tiana and the Fairy Godmother will attend. May be added to any package.